No joke: My grandparents used to import bialys from Manhattan. They would freeze them and store them in zip-lock bags in the freezer of their Los Angeles kitchen. One of my favorite childhood memories is of sitting at their kitchen table, eating a hot, toasty bialy, sneaking sips of my grandfather’s coffee. While often grouped together with ubiquitous bagels, bialys are very much their own thing. The word “bialy” is a shortened version of Bialystocker Kuchen, or “bread from Bialystok, Poland.” For the wealthy, kuchen was an accompaniment to meals, while, for the poor, it was the whole meal. Today the bialy is a delicacy unto itself. Whereas bagels are boiled, then baked, bialys are baked in a hot oven. This means the bialy’s outside is matte, not shiny like bagels, and its edges are crunchier. 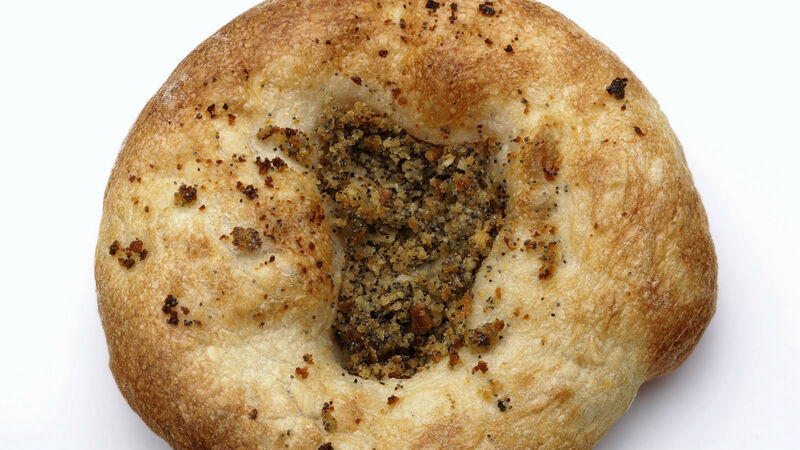 The bialy’s interior is similar to a ciabatta bread, and its crust is pleasantly crisp. 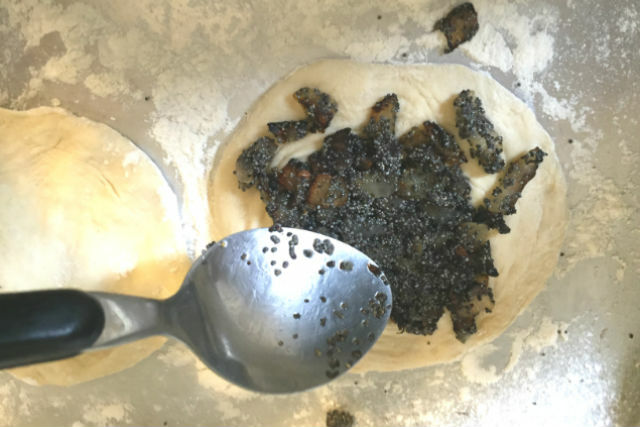 They are almost always filled with cooked onions, and often also with poppy seeds, as in this version. I once read a recipe for traditional bialys, and discovered that the dough is nearly identical to my pizza dough recipe. As such, I now love to use simple, cheap pizza dough (either store-bought or homemade) to make my bialys. Once the dough has come to room temperature, you only have to cook the filling, spoon it into the dough rounds, and pop them in the oven. Because it is so easy to prepare, this recipe is a fabulous brunch option. Throw together a frittata or scramble, set out some cream cheese, butter, whitefish, and lox, then pull your hot bialys out of the oven and pop them onto a platter. Depending on where you live, it can be hard to find a decent bialy, but with this recipe, you can have a New York morning whenever you please. Flour a baking sheet and set aside. Cut dough into 6 (for larger bialys) or 8 (for smaller ones) equal pieces. 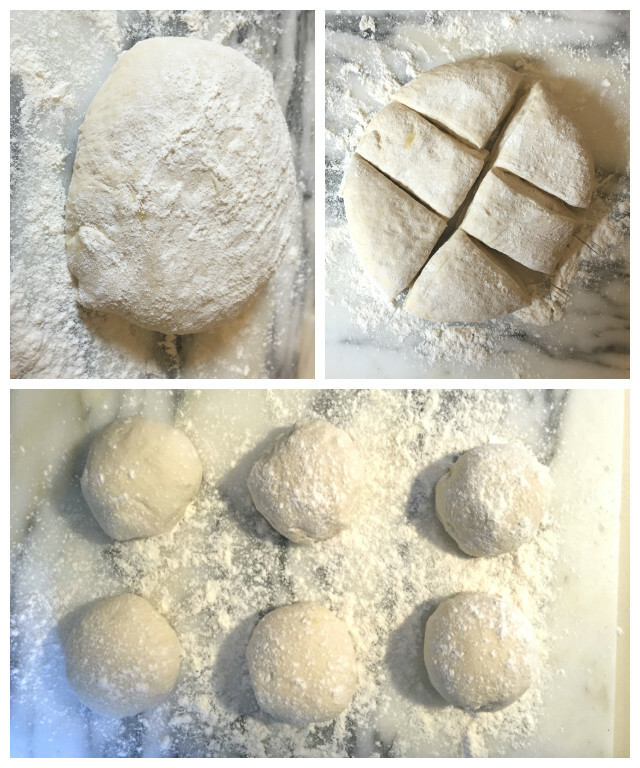 Shape each piece of dough into some semblance of a 4” or 5” circle (they need not be perfect—in fact it’s better if they aren’t). Let the dough rest for 10-15 minutes. While the dough rests, heat the oil in a large frying pan over medium heat. Add the chopped onion and cook for 7-9 minutes, or until very soft and golden-brown. Add the poppy seeds and salt and pepper to taste. Remove from heat and allow to cool for at least 5 minutes. Press about 1 ½ tablespoons of the onion mixture (more, if it will fit) into the well you created in each bialy. Bake for 12-14 minutes, or until the bialys are golden-brown with crisp bottoms.